Quality Construction takes a special approach when dealing with commercial roofing projects. As there is a vast range of commercial needs we have developed a strong team with a high level of education on different types of roofing systems and the individual needs of our client building needs. We are skilled in maximizing roof life expectancies through our “Quality Maintenance Programs”, this can help eliminate damage for a warranted period of time while deciding and budgeting towards a more permanent solution. We are also skilled in providing “Quality Loss Assessments” which can help rate the value of a specific building and help board members create budget plans for specific properties and tier them for a future repair plan. So whether you need a small annual maintenance program or a large multi year, multi building budget plan created Quality Construction has the personnel to satisfy your needs! Call today and we can schedule a consultation with one of our highly skilled Commercial Representatives. EPDM is an extremely durable synthetic rubber roofing membrane (ethylene propylene diene terpolymer) widely used in low-slope buildings in the United States and worldwide. Its two primary ingredients, ethylene and propylene, are derived from oil and natural gas. 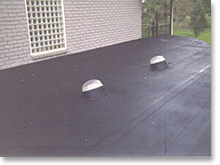 Since its inception in the early 1970’s EPDM roofing has been a commonly used commercial product with some of the strongest warranty periods in the industry. Components for TPO are blended together at 210 - 270 °C under high shear. A twin screw extruder or a continuous mixer may be employed to achieve a continuous stream, or a Banbury compounder may be employed for batch production. A higher degree of mixing and dispersion is achieved in the batch process, but the superheat batch must immediately be processed through an extruder to be pelletized into a transportable intermediate. 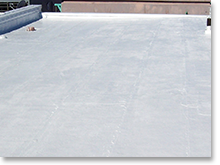 Thermoplastic polyolefin (TPO) single-ply roofing membranes are among the fastest growing commercial roofing products and have gained broad industry acceptance for their many performance and installation advantages. Due to the high quality in material and competitive pricing TPO is a growing choice for many of Quality Construction customers. This type of roofing is an evolution of asphalt roofing. It is made from asphalt and a variety of rubber modifiers and solvents. There are several ways of connecting pieces of this material. In a heat application process the seams are heated to melt the asphalt together and create a seal. There is also hot-mopped application, similar to how conventional built-up roofs are installed. Cold-applied adhesives and self-adhesive membranes are two of the more recent options. Modified Bitumen systems combine the layers of a BUR system during the manufacturing process rather than during the application process, creating a single-ply application. 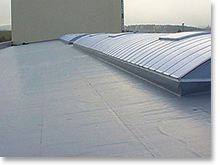 Polymer modifiers can be added during the manufacturing process to give the roof additional elasticity, temperature flexibility, and weather ability. typical roof coating dry film thickness vary from paint film thickness (plus or minus 3 dry mils) to more than 40 dry mils. This means a roof coating actually becomes the top layer of a composite roof membrane and underlying system. 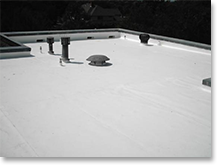 As such, the roof coating is the topmost layer of protection for the membrane, receiving the impact of sunlight (both infrared and ultraviolet (UV), rain, hail and physical damage. Coatings are typically a fraction of the cost of full roof replacement and if applied properly can also be a warranted system through some manufacturers that provide a level of protection between 5 and 10 years. Due to the attractive low price point and effectiveness of the system Roof Coatings are a common maintenance solution to Quality Customers! Here at Quality Construction we take safety very seriously. We value the safety of our employees as well as the residents/tenants on all properties we work with. We have continued to be an industry leader with our daily safety meetings and our precise communication with building occupants regarding our daily construction procedures. We have in the past and will continue in the future to make safety our top priority at Quality Construction. So whether you are looking to increase the value of your investment building or simply taking care of the residents of a multi-family dwelling Quality Construction has you covered!